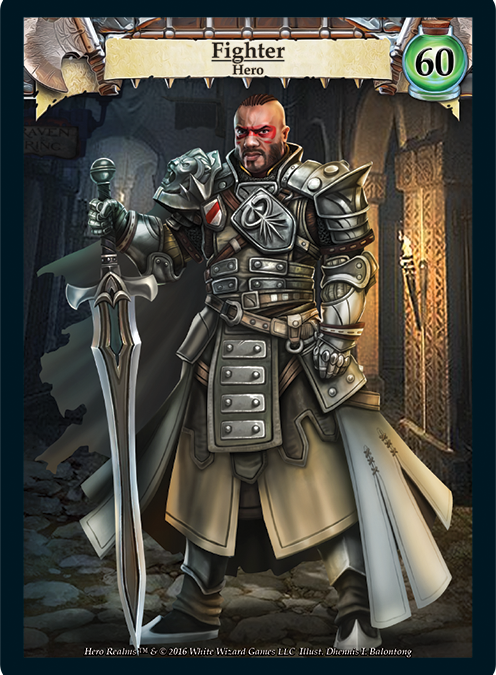 “Thandar has a robust mercenary industry. While most that sell their services are handy in battle, the Fighter is in a class all of their own. Do not expect more of them than this, because this is all they know.” – The Emperor’s Guide to Thandar. The Fighter Deck is similar to the Wizard with a high-combat ratio, but the Fighter deck is a little more focused towards combat. And by “a little more”, we mean a lot more. With the highest starting health, multiple weapons and the ability to dish out 15 combat on the first turn, the fighter is a force to be reckoned with. The Fighter’s abilities and starting deck necessitate an aggressive strategy, because with their high damage in the early game, comes an inability to keep up with other classes in the late game. 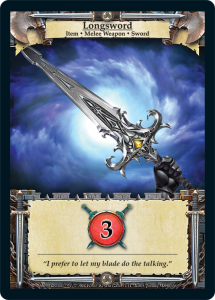 “When looking for a sellsword you must keep in mind that, though you see many available and looking for work, the best warriors don’t need to advertise.” – The Emperor’s Guide to Thandar. Unlike most class abilities, the Shoulder Bash starts strong and stays at about the same power level all game. While Pickpocket, Bless, Track, and Channel all do effectively more as the game goes on, 2 damage is always 2 damage, and increases in power only when it starts threatening your opponent’s health. Because of this, the Fighter uses their ability as necessary, either to clear an opponent’s champion, activate throwing axe, or when dealing 2 damage is better than adding something to their deck. Don’t be afraid to use this in the mid game over buying something that isn’t worth much to your deck. As a Fighter, you can rely on your ability to consistently output combat more than other classes, and 2 damage adds up over the course of the game. This doesn’t mean you should neglect big purchases, but rather that a shoulder bash can be better than a fire gem. “You will hear screaming. This is normal.” – The Emperor’s Guide to Thandar. 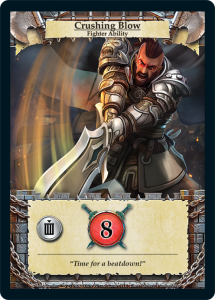 The Fighter Deck has plenty of starting purchasing power, and Gold is even less useful for the Fighter than other classes that aren’t trying to push for combat early. This and the Shield Bearer are the best sacrifice targets. Can’t go wrong with a Ruby in your starting deck. It brings the starting deck Gold to 8, and a potential single-hand buy of 6. The Shield Bearer gives some extra health and protects your other champions. Without any abilities, this protects you from attacks that do less than 3 damage, but its certainly not as necessary as the other cards in your deck. 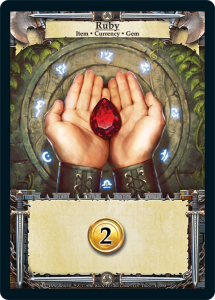 An extra gold is often better than 3 health, so don’t be afraid to sacrifice this card early in the game. Now this is a Fighter card! 3 combat is quite threatening in the early game, and with your abilities and game plan, ensures that you’ll be able to deal with Champions that are put in your way. This is the bread and butter of the Fighter class. 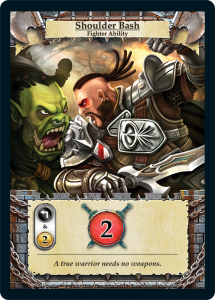 2 combat is a fine starting card by itself, but the real power comes from the ability to draw. Since this card needs to make at least 7 combat, you have to have at least 5 combat from other sources in order to draw a card from this. With just the cards in your starting deck, you can trigger this ability with either Crushing Blow, or by activating Shoulder Bash and playing the Longsword aside it. 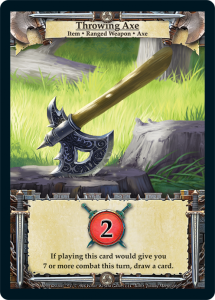 Luckily, your deck and strategy start by leaning towards combat, so the Throwing Axe gets better as you purchase cards from the trade row. 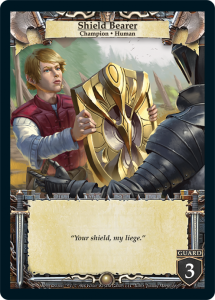 While saving your Crushing Blow to take out champions is the most value you can get out of it, don’t be afraid to use it to draw a card with the Axe if the card draw is really valuable that turn. “Remember to pay your fighters properly. 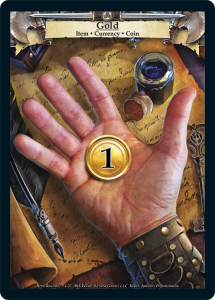 Do not make a mistake and assume that they cannot count.” – The Emperor’s Guide to Thandar. High health and high damage make the Fighter an immediate threat. It’s not exactly a beginner deck, but it would definitely suit a beginner with an aggressive play style.